I was on my way home from a fun bike ride on Exposition Avenue and in Deep Ellum when I saw traffic coming to a sudden stop and a column of nasty black smoke rising in the distance. 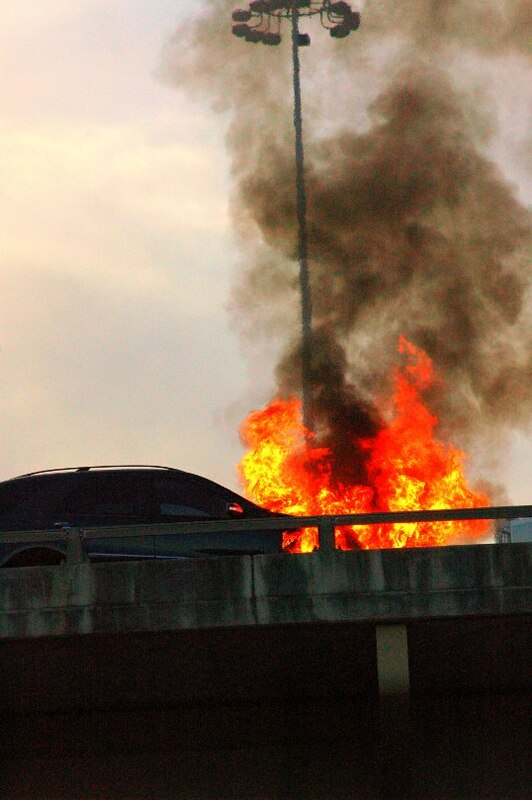 A car was on fire, right before the Highway 75 Exit to Woodall Rogers. I had this happen to me once… it isn’t fun. Years ago, I was sitting down in a cheap Chinese restaurant, about to dig into a lunch-portion of cashew chicken when somebody stuck their head in the door. “Excuse me, does anyone in here drive a blue Ford?” he asked. “I do,” I piped up. I assumed I had left my lights on or some such drivel. Not good news. I had been having trouble with the carburetor (this was in the ancient days of yore when every car had at least one carburetor) backfiring and such and it seems to have decided to spit out flames while it was sitting there in the tiny parking lot of the Chinese restaurant. This was in the dark days, the absolute nadir of American engineering and the cars were all a terrible, complex mess with all sorts of odd-looking, unfathomable, and flammable parts bolted to their engines and equipped with carburetors that, apparently, were prone to self-immolation. It had a mile of rubber hoses and tubing supposedly fulfilling mysterious functions running all over under the hood like a giant bowl of evil black spaghetti. All of this was burning, sending a giant column of toxic smoke high into the gray sky. I stared, dumbstruck into inactivity, at the conflagration until the proprietor came out with an extinguisher… so I extinguished it. 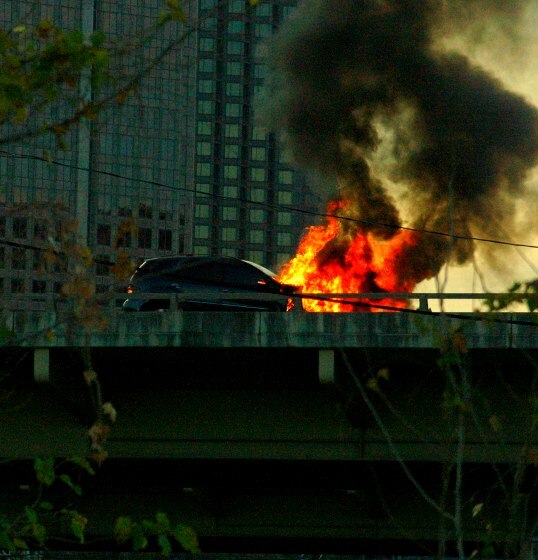 The white powder mingled with the black soot and molten rubber in such a mess that I knew the car had had it. Now I was faced with a difficult choice. The whole restaurant was staring at me, standing there, holding the spent extinguisher next to my ex-vehicle… but I still had a fresh plate of Chinese food sitting inside. So, I sucked up my pride and what little dignity I had left… walked back inside, sat down, and resumed my luncheon. This was only about a half-mile from my work, so after I finished I strolled out and walked back along the road to my work for the afternoon. This was before cellphones, so I couldn’t really even call anybody to come get me… and I don’t think I would have anyway. While I walked I would look back over my shoulder at the column of evil black smoke as it continued to rise and then spread out in a cloud that seemed to hover high in the sky, exactly between me and the bright spot in the cloud cover that represented the sun. I wanted to put this whole thing behind me, so I signed the title, stuck it behind the license plate of the burned out wreck, and had a salvage company come take it away for its scrap metal value without my presence. I asked them to pay the owner for his extinguisher in cash, and they sent me a check for whatever was left. I was able to buy two Compact Disks with the balance… I think they were Tears for Fears and Fine Young Cannibals (their second CD). 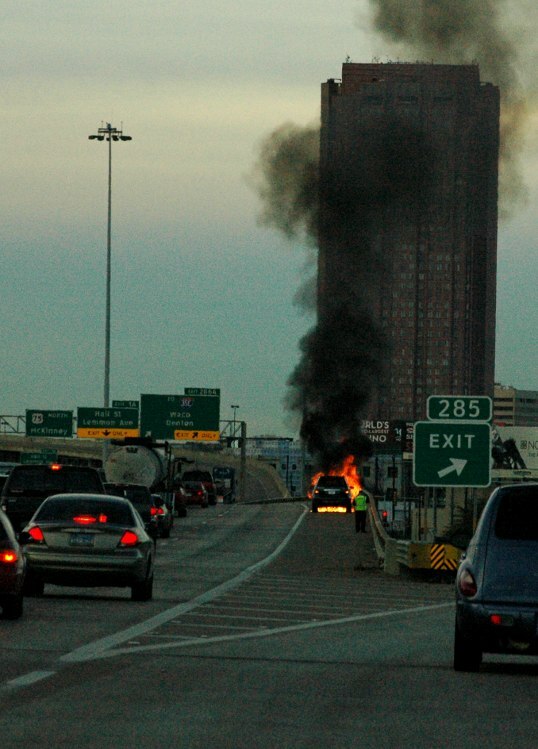 This entry was posted in Daily Epiphany and tagged car, Dallas, fire, highway, Photography, postaday, street photography, traffic. Bookmark the permalink. It wasn’t quite that long ago, but I do remember 8-tracks… and miss them (a little). Tee hee, they were just before my time 🙂 My friend had an old Gremlin with an 8-track. Coolest. Car. Ever. Wow! I go down Woodall and 75 North all the time to get pasta in Dallas, so its surreal to actually see all the signs and know the exact location you are talking about. I’ve only seen one 18-wheeler catch on fire while I was interning for kindergarten, we were outside for recces when suddenly all the kids said it was snowing, but of course it wasn’t really snowing. The 18-wheeler was carrying a bunch of toilet paper and we were getting the debris from the wind blowing from the nearby service road. The kids finally figured out what was going on when we heard the second explosion and we had to bring the kids in to get them away from the blizzard of toilet paper. I went off on a tangent now, haha. That’s amazing, a blizzard of toilet paper. Those kids will remember that all their lives – in the future they will tell people about it and nobody will believe them.